Davidi Kitai outlasted a small-but-stacked field of 195 entrants to take down his second bracelet in Event #19: $5,000 Pot-Limit Hold'em, along with about a quarter of a million dollars. 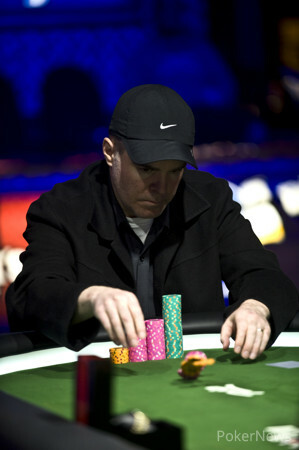 His other bracelet came also came in a PLHE event, a $2,000 buy-in, when he won $244,583. Sixteen players entered Day 3, and Jesse Martin was the chipleader. He was unable to get much going however, and he busted in 10th place. 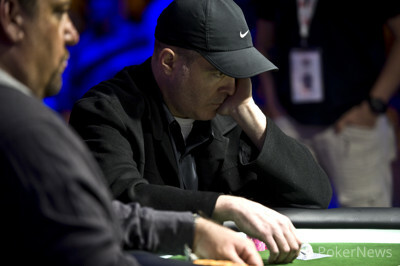 Online legend Dan "djk123" Kelly was also an early casualty, as his fourth Day 3 of this World Series of Poker was cut short when he busted 12th. The final table lasted a mere 90 hands, and Kitai was the chipleader almost from start to finish, despite facing a formidable row of opponents that included bracelet winners Dario Minieri (8th), Bertrand "ElkY" Grospellier (7th) and Eugene Katchalov (5th). Kitai grabbed the chiplead shortly after the unofficial, 10-player, final table began when he made a big calldown against Minieri. He then turned up the aggression, opening pots constantly, and went into heads-up play against Cary Katz with a big lead after busting two players when his nines held up in a three-way all in against the of Vincent Bartello (3rd place) and the of Dimitar Danchev (4th). Katz battled fiercely in the heads up, and even took over the chiplead. In the end, he got it all in with kings against Kitai's jacks when Kitai had him covered, and Kitai was fortunate enough to spike a jack on the flop to seal the tournament. Kitai added a second bracelet to a collection of championships that also includes WPT and EPT titles. Thanks for follow along, we'll be back tomorrow with more tournament coverage. Cary Katz - 2nd Place. Hand #87: Cary Katz gave Davidi Kitai a walk. Hand #88: Kitai made it 70,000, Katz folded. Hand #89: Katz raised to 60,000. Kitai called. The flop came . Kitai check-called 50,000. Kitai then led out 65,000 on a turn. Katz folded. Hand 90: Kitai raised to 60,000, Katz made it 160,000. Kitai came back with 360,000. Katz reraised pot, and Kitai snap-called. The flop came , and Kitai pulled massively ahead. The turn brought Katz no help, and neither did an on the river. 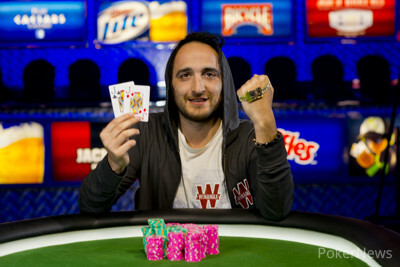 Kitai had Katz slightly covered, and he is the champion of a Pot-Limit Hold'em event here at the World Series of Poker for the second time. Hand #79: Cary Katz raised to 60,000 on the button, and Davidi Kitai folded. Hand #80: Kitai raised to 60,000 on the button, and won the hand. Hand #81: Katz limped in on the button, Kitai raised to 90,000, and Katz called. The flop came , Kitai led out for 65,000, and Katz called. The turn was the , Kitai led out again - this time for 145,000 - and Katz called. The completed the board, Kitai fired a final bullet worth 175,0000, and Katz snap-called, showing for a straight. Kitai mucked and sat back in his chair with an unhappy look on his face. Hand #82: Kitai raised to 60,000 on the button and won the hand. Hand #83: Kitai received a walk. Hand #84: Katz received a walk. Hand #85: Katz limped in on the button, Kitai raised to 90,000, and Katz folded. Hand #86: Kitai raised to 60,000 on the button, Katz called, and the dealer fanned . Katz check-called a bet of 55,000, and the turn was the . Katz check-folded to a bet of 115,000, and Kitai dragged in the pot. Hand #75: Cary Katz raised to 60,000 from the button. Davidi Kitai made the call. The flop came , and Kitai check-called 50,000. The turn came . and both players checked this time. On the river, Kitai fired out 135,000 and got a fold from his opponent. Hand #76: Kitai raised to 60,000, Katz called. The flop came , and Katz check-folded to a 55,000 bet. Hand #77: Katz raised to 60,000, and Kitai reraised. Katz came back with a four-bet to 300,000. Kitai fired right back with 900,000, and Katz finally relented. Hand #78: Kitai raised to 60,000, and Katz made the call. The dealer laid out , and Katz checked. Kitai fired 55,000, and Katz wasted no time in calling. The turn came , which both players checked. A fell on the river, and Katz bet 100,000. Kitai called after some thought. Katz showed him to take the pot. 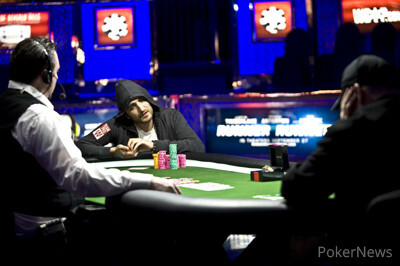 Davidi Kitai and Cary Katz heads up. Hand #69: Cary Katz limped in on the button, Davidi Kitai checked, and then Kitai check-folded on a flop of . Hand #70: Kitai raised to 60,000 on the button, and won the pot. Hand #71: Katz had the button, and raised to 60,000. Kitai three-bet to 140,000, and Katz folded. Hand #72: Kitai min-raised to 60,000 on the button, Katz defended, and the dealer fanned . Katz checked, Kitai continued for 45,000, and Katz called. The turn brought the , Katz check-called another 135,000 from Kitai. The completed the board, Katz checked, and Kitai bet the pot. Katz snap-folded. Hand #73: Katz raised to 60,000 with the button, Kitai called and the flop fell . Both players checked and the turn was a repeat queen - the . Kitai led out for 70,000, and Katz folded. Hand #63: Davidi Kitai raised to 50,000, and Cary Katz called. The flop came , and Katz check-called 40,000. The turn came . Katz check-called 110,000. The river came . Katz checked a final time. Kitai checked behind. Katz took the pot with . Hand #64: Kitai raised to 60,000, and Katz folded. Hand #65: Katz raised to 60,000, and Kitai made it 150,000. Katz folded. Hand #67: Kitai got a walk. Hand #68: Kitai made it 60,000 on the button, and Katz called. The flop came , and Katz check-called 55,000. He checked once more on the turn, and Kitai fired 115,000 this time. Katz again made the call to see the . Katz led the river for 145,000, and Kitai called after some thought. Katz showed , and Kitai mucked. 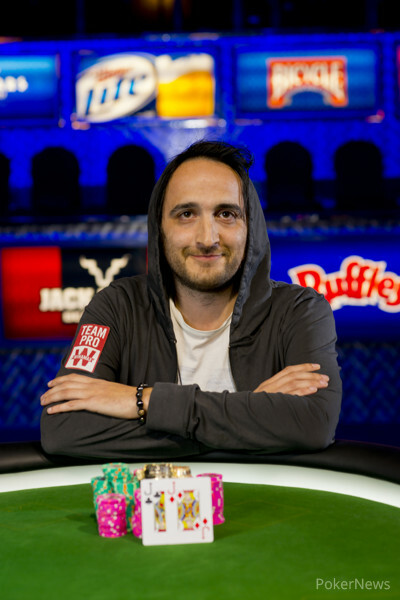 Hand #61: Davidi Kitai raised to 50,000 on the button. Cary Katz reraised to 150,000. Kitai folded. Hand #58: Cary Katz had the button and raised to 48,000. Davidi Kitai called, and the flop came . Kitai checked, then folded when Katz fired out 52,000. Hand #59: Kitai had the button and raised to 50,000. Katz called, then checked when the flop fell . Kitai fired 48,000, Katz called, and the turn brought the . Katz checked, Kitai tossed out other 105,000, and Katz folded. Hand #60: Katz limped in on the button, Kitai raised to 84,000, and Katz called. The flop came , Kitai led out for 65,000, and Katz called. The turn was the , Kitai checked, and Katz knuckled behind. A third heart - the - completed the board, and Kitai flipped 40,000 forward. Katz raised to 100,000, Kitai called, and Katz showed for the nut-flush. Kitai mucked.